Macon County Patriots: It's a Great Day to be an American! il-leg-al: forbidden by law or statute. It's a Great Day to be an American! 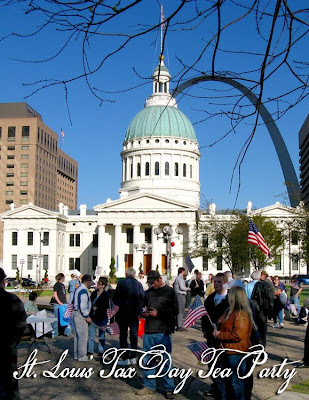 The St. Louis Tax Day Tea Party at Kiener Plaza was an experience of a lifetime. Never before have I ever been a part of thousands of people standing together for one common cause. The sea of American flags and red, white and blue everywhere you looked. The most incredible feeling was the peacefulness over such a huge crowd and then the laughter & camaraderie heard throughout the day between complete strangers. The final count for the St. Louis rally was 8,000 people. The organizers were Bill Hennessy, Dana Loesch, Master of Ceremony was Kevin Jackson from The Black Sphere. Other speakers included Jim Hoft from Gateway Pundit and Gina Loudon. A brilliant and successful move on the part of Bill Hennessy was when he took criticism from someone in regard to the waste of tea at the first St. Louis Tea Party held at The Arch on February 27th and turned it into a golden opportunity to be a blessing to the city at the Tax Day Rally. One comment on his blog criticized him for wasting food by throwing the tea into the river. Bill called all the food banks and asked if he collected food for them would they be able to provide a way to pick it up. The Tea Party participants filled a one-ton truck and donated about $600 cash for Operation Food Search and Circle of Concern. Brilliant! The final tally of Tea Parties across the United States was 750,000 people participating in over 800 cities, towns & villages from coast to coast. And the message has been heard that We The People are holding the politicians feet to the fire because next year is our year to take back our government. The President and his administration have shown that they were caught off guard by the united voice of the American people and their actions of grasping at more smoke and mirrors show how un prepared they were for our success. The common question after the Tax Day events has been, “What do we do now?” This is only the beginning. Now is the time to get involved, to be determined to continue to fan the fires and keep the politicians unsure of their future if they don’t start earning their keep and doing what WE hired them to do. Connect, communicate, get involved on the local and state level. Learn and understand how our government works. The Main Stream Media (& local) have tried to ignore and down play the magnitude of the voice of the American people. It’s up to us to shout it from the housetops. Get informed, when you hear something false being generated by the MSM, be informed enough to correct it with truth. There are some great blog sites, including this one who are armed with truth. Stay informed on the bills at the State and Federal level. Write, call, email, fax your representatives. Use your voice! And I fervently encourage you to find the location of an Independence Day Tea Party and attend it with your family & friends. It truly is a great day to be an American!